NEOCOTA have been designed to comply with current US FDA and other international legislations as well as anticipated trends. 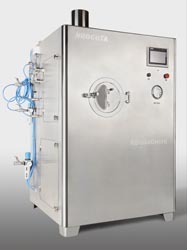 Apart from Main Pan Cabinet, NEOCOTA has the Air Handling System, the Spray System, the Control and Documentation System among others, to enable the user to maintain standards for the entire range of coating operations. NEOCOTA is a truly flexible system for aqueous or organic solvent based film coating. NEOCOTA is also suitable for sugar coating. NEOCOTA is equally suitable for loading of drugs on tablets and pellets during film coating or sugar coating. Due to its unique design features, it is possible to coat tablets and pellets of any size and shape in NEOCOTA. NEOCOTA can run any coating programme without manual intervention. NEOCOTA performs any coating programme without constant operator's assistance. The menu-driven system can be run either through the work station placed in the coating area or through supervisory station with suitable interface equipped with to-and-fro communication ability. Data collection can be alphanumerical and/or graphical to monitor ongoing operation and to detect fault, in case of mechanical failure. NEOCOTA offers a combination of design parameters essential for superior coating results. The major design advantages of NEOCOTA are easy loading and discharge, easy operation and cleaning and quick validation and documentation. NEOCOTA helps customers perform different coating operation, maintaining GMP throughout the process without any compromise. It also helps them comply with guidelines and norms prescribed by drug authorities. NEOCOTA control panel is equipped with suitable Microprocessor or PLC with Man Machine Interface, which has flexible capabilities to control and maintain various process parameters automatically. The system offers Alarm Annunciation for fault detection. NEOCOTA Coating System is supplied with suitable Air Handling System. On the supply side, atmospheric air is drawn through Filters and then heated in a suitable Heater before supply to the Pan for drying. A suitable Exhaust Blower expels the vapour ladden air after drying. Multistage filtration of incoming air upto HEPA filter is provided. An integrated CIP (Clean-in-place) washing system complete Pump, Jet Nozzles, suitable Sink and Drain connenction permits easy washing and cleaning of the Pan. The Pan Cabinet is so designed as to make it free from any sharp angles, ledges and cervices, preventing contamination by residual product. Internal geometry, construction and surface finish facilitate smooth and effective cleaning. The system need not be disassembled for inspection for cleaning validation. 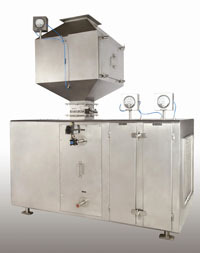 Mostly all NEOCOTA models are equipped with in-built, easy to operate automatic unloading device. Tablets or Pellets are unloaded automatically from the Pan through a Scoop fitted on the front door opening. The system is complete with overload protection, explosion-proof construction, intrinsically safe earthing arrangement, pressure regulators, etc. Pre-set parameters are efficiently controlled by Microprocessor or PLC.Combination of key switches and passwords deny unauthorised access to process parameters. Repeatability and traceability are ensured to record the process details, reason of failure and such other requirements. NEOCOTA is also available in Dual Pan Configuration. It is possible to coat different batch sizes, in the same machine with interchangeable Coating Pans and other changed parts thereby eliminating the need of purchase of number of machines for different batch sizes. 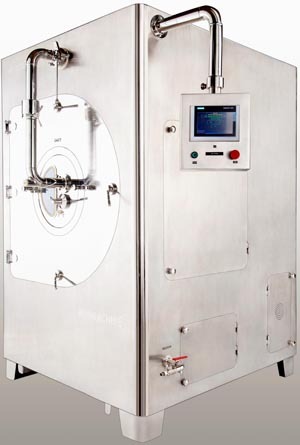 NEOMACHINE has developed R & D models of Coating System having capacities ranging from 500 gms to 5 Kgs. R & D models are available in Dual and Triple Pan Systems offering maximum flexibility for trial coating.